‘The Jewish hotheads in the audience lost the argument for British Jewry when it could so easily have been won. Their unbecoming conduct was an embarrassment. They need to learn that unless called to speak, a dignified silence is more effective than yelling, and that in a good debate it is the laser-precision of carefully chosen words in a structured argument that destroys an opponent and wins the day. 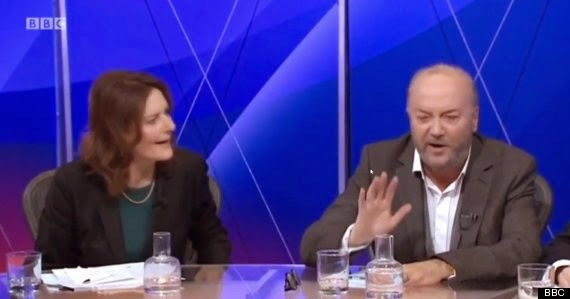 Although George Galloway may have been feeling sore and embittered at the behaviour of Dimbleby and Freeland, he easily won the argument. His clinical analysis, despite the attempts to shout him down, triumphed over their boorish cat calls. Nothing amused me more than one lout’s ‘You’re not welcome here’ taunt. Wasn’t this what the fascists used to say to the Jews? But then anti-Semitism and Zionism have always been twins. The Zionist louts were playing to the audience in the hall, but the real audience was in peoples’ sitting rooms, a fact that didn’t seem to have occurred to them as they engaged their own petty emotions. Below is George’s own take on the night. 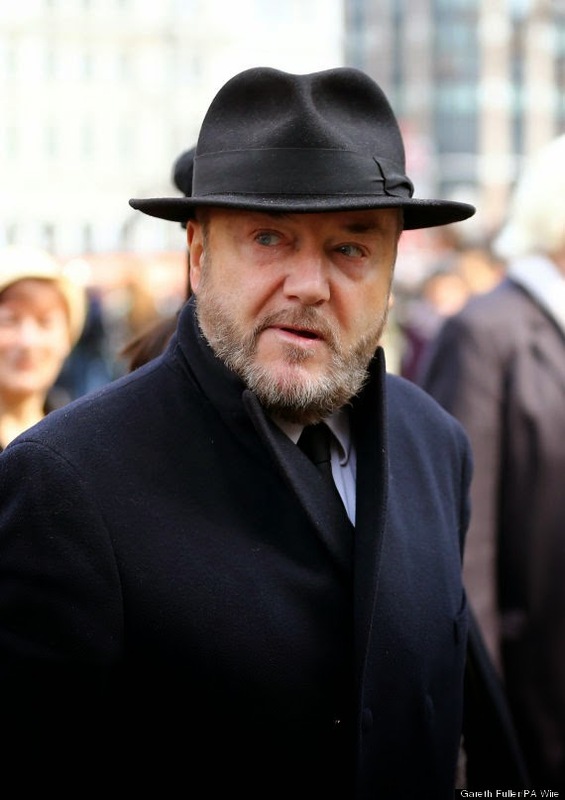 George Galloway is critical of Jonathan Freedland's hypocrisy, calling him a McCarthyist. That is giving him credit for a degree of acumen that he doesn't possess. Freedland was more interested in cheap applause. If he knew anything about the Middle East situation today and Israel's role, he would understand that Israel's securocrats look favourably on ISIS. There have been a number of reports of their fighters being treated in Israeli hospitals. That is what the bombing of Hezbollah was about. Israel wants to see the cantonisation of Syria and who better to achieve it than ISL? The naivety over chemical weapons is barely worth commenting upon. As someone who stresses his Jewishness, Freedland more than anyone knows that the responsibility for any increase in anti-Semitism (itself a dubious proposition) should be laid at the door of those who seek to associate British Jews with Israeli war crimes, i.e. the British Jewish establishment such as the Board of Deputies. But putting their noses out of joint would be to break the habit of a lifetime and risk offending the powerful. Freedland has got where he is today by a superficial smugness not a bold critique of the powers that be - Jewish or non-Jewish. Dimbleby's role barely merits comment. It is difficult to know whether he was being machievellian or just incompetent. I prefer the latter as he was clearly out of his depth. In the wake of last week’s BBC Question Time and subsequent events I wanted to make some observations. They are not in order of importance indeed to an extent the reverse. I feel very let down by David Dimbleby. I have known him a long time, have always respected him and I didn’t expect the serial failures of which he was clearly guilty. Again in no order of importance; his gratuitously insulting comment “when you turn up” was not just fatuous (he knows well that I am in parliament every day for much of my last 27 years) but was the only jibe at any of the panelists last night. Why? 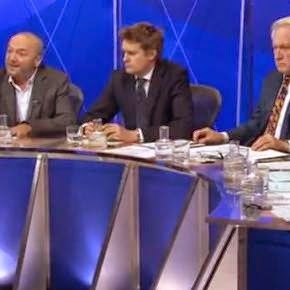 To insult just one of five panelists – me – in the highly charged atmosphere of the Finchley studio was questionable judgement to say the least. Mr Dimbleby told me immediately after the show that the final question posed by the audience was not in fact the question which had been tabled and selected. The last part of the question which sought to put me on show trial, make the final part of the show about me, had merely been added after the fact by the questioner. This has subsequently been admitted by the questioner in the Jewish Chronicle. But there there was no point in telling me this in private with an apologetic air (he did not actually apologise, I gave him more credit than he deserved in my initial comments after the show) when millions of people oblivious to the trickery were about to watch the results on the show. He could have shot the question again, the show is not live, there is time for editing (although the only person who was edited was me with a chunk of my answer on Bradford schools mysteriously excised). He could have made it clear on the recording, immediately, that the question had been changed, with obviously potentially defamatory consequences. He did neither and with predictable results. The audience selection supposedly scientifically calibrated was laughably biased. Ludicrous and counter productive though that turned out to be, there was no guarantee of that outcome. I know of several pro-Palestinian supporters, Muslims, and Respect members who were turned down in their attempts to join the audience. Fanatic supporters of Israel evidently had no such difficulty. Contrary to contrived opinion, Finchley is not in an overwhelmingly Jewish borough. There are, to name just one section of the Finchley community, many Muslims who live there. Not a single visibly Muslim person made it to the audience. Instead of punishing those loudly shouting against me, whom he had repeatedly asked to stop barracking me trying to stop me from speaking, Mr Dimbleby explicitly told two of them that he would call them to speak and then cut me off in order to facilitate it. It would never happen in parliament. A special place in the hall of shame must go to the Guardian’s executive editor Jonathan Freedland selected for the role of chief prosecutor in the show trial. The Guardian, a faux liberal newspaper which last summer accepted (that which even Rupert Murdoch had declined) a paid full page advertisement from an Israeli organisation while the blood was still running in the streets of Gaza seeking to justify the slaughter and slander the Palestinians, thousands of whom had by then been slain. There is intense competition for the title of Hypocrite in Chief at The Guardian but Freedland in my view shades it. 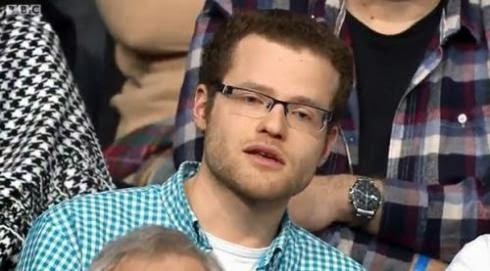 Once the doctored question had been posed, he lit the touch paper before smugly stepping well back. He made a series of distorted allegations against me knowing that if I got into rebutting them there would have been no time for the bigger picture. Like a latter day McCarthy he patted a portfolio which he claimed contained the basis for his allegations. Who produced this dodgy dossier must be open to question. He said that I had claimed “Israel was behind the revolution (sic) in the Ukraine” but this is false. I did say on a television programme that the Israeli daily newspaper Haaretz had run a feature on at least two Israeli army reservist officers who themselves boasted of their role in the fighting in the Maidan coup against elected government of the Ukraine, prior to the overthrow of the President, the burning of the Parliament and the holding of guns to the heads of the parliamentarians to force them to validate the coup. In that television broadcast last year I pointed out the irony of Israel army officers lending their military expertise to a “revolution” the cutting edge of which was provided by (and seen by all to be) ultra right wing Ukrainian nationalists and several thousand explicit fascists who held aloft the portrait of their historic leader Stepan Bandera who openly collaborated with the Nazi occupation forces and herded Ukrainian Jews into the cattle trucks bound for the death camps. Thus a statement of mine attacking antisemitism and the Holocaust was transformed by Freedland into a charge on my indictment for antisemitism. He further alleged that I had claimed that Israel had supplied chemical weapons used in the attack on Goutha which in 2013 had propelled the US and Britain and others onto the tarmac, their engines revving ready to be the Air Force of what has now become ISIS. I did say at the time of the attack that one theory was that the Syrian ‘rebels’ were the ones who had used these weapons on the basis that the Syrian regime was unlikely to have chosen the day of the arrival of the United Nations chemical weapons inspectors to launch a chemical weapons attack a few kilometres from where the inspectors were just settling into their hotel. I continue to believe that this was the case. I did say that if they did one possible source of the chemicals could have been Israel. As it happens this theory was superseded by my later claim on the BBC Daily Politics with Jo Coburn that the supply of the chemical weapons was more likely to have been provided by other regional powers. But there was nothing outlandish about my first theory. The proximity of Israeli forces to the Syrian ‘rebels’ is at its closest a few hundred metres. Israel has a mountain of chemical biological and nuclear weaponry. Israel has used its chemical weapons against Palestinians and UN facilities in the territory. Israel is militarily engaged in Syria against the Assad regime and has repeatedly bombed their positions, facilities and allies. Most recently in the Quneitra on the Golan Heights in January of this year. The Israeli media has reported that wounded Islamist fighters have been treated and sent back to the battle field from Israeli field hospitals and in Israel itself. Finally the Israeli security service the Mossad is more than capable of assisting the Syrian opposition in such a way if they were minded to do so. Moreover both of these instances cited by Freedland were broadcast on a television station no longer available to British TV viewers nor can they have been seen by many in Britain. Certainly to hold these responsible for a spike in anti-Semitic incidents in the UK is absurd. In addition to these two specific allegations Freedland claimed that my “rhetoric” had in part produced the atmosphere for the spike. He did not elaborate because he could not. All of my rhetoric and for more than forty years is against Israel. None of it is against Jews. The only time I ever mention Jews in my “rhetoric” is to single out Jews for honour and praise, to repetitively insist that our fight is NOT against Jews. And of course to describe as I did again on QT (though my critics were not listening) the Holocaust as the greatest crime in human history and to call for the denial of it to be a criminal offence in Britain as it is in several European countries. Freedland’s own rhetoric spoke volumes however. He referred to last summers slaughter as a “resumption of violence” in Gaza. Firstly violence has never ceased in Gaza for almost half a century at least if you include military occupation, siege, calorie-counting quarantine, targeted and un-targeted assassinations and regular full scale invasion as violence as most people would. Last summer was not the ‘resumption of violence’ but the cold-blooded killing and maiming of thousands of people, most of them women and children, inside a prison camp from which there was no means of escape. In drawing on the CST report coincidentally released on same the day of Question Time, Freedland deliberately exaggerated its contents. Whilst every single incident of antisemitic bigotry is to be utterly condemned it is simply untrue to say as he did that 1000 attacks on Jews took place in Britain on 2014. In fact the number of Jews attacked was 84. One of which was a serious violent attack. I know about those as I’ve suffered one myself by a Jewish convert and Zionist fanatic wearing an IDF shirt. The figure of 1000 includes for example “on-line” anti-semitic slurs and no doubt, threats. That would be a quiet year for me. I’ve received about a thousand such slurs in the last few weeks. It is hurtful alarming and disgusting when such things happen and the police should deal with it rigorously. But it is not the same as an attack as most people would understand it. There is and always has been anti-semitism in Britain as there has always been racism of other kinds. I am its implacable enemy and have been all my life. But if there are, as Freedland said,around 300,000 Jews in Britain then statistically speaking the number of attacks upon Jews even if we include attacks on their properties bears no comparison to the numbers of hate attacks upon other minorities including homosexuals, black people, Asians, not to mention Muslims who have suffered many times over more such attacks than have British Jews, the main difference being there are not many police officers standing guard outside mosques. Recorded anti-semitic hate crimes constitute 0.5% of all recorded hate crimes in Britain almost the same proportion as Jews to the population as a whole. All attacks on any minorities or their property should surely be condemned equally. They certainly were not on Question Time. Finally Freedland was right about one thing though. Every time there is as he put it “trouble” in the Middle East there is a rise in anti-Semitism just like every time there is an outrage by Islamist extremists there is a rise in Islamophobia. All the more reason then to resist and repel the false conflation, the fake synonyms that Israel equals Jews and Muslims equal terrorism. Freedland like so many liberals wants to have it both way. Having painted a picture of a Britain seething with anti-semitism he then said that Britain was “not an anti-semitic” country. He said the fear was of a “Paris style attack” motivated by Al Qaeda or ISIS type elements. It is those who insist with such vehemence that they must defend what Israel does, that it does it in their name, and in the name of their religion who are responsible for the blurring of the dichotomy upon which I always, without exception, insist. I turn momentarily to the bit-players on the panel. Cristina Odone the saintly figure with wandering hands who is never done telling us what a Christian she is, her voice breaking with emotion, told us of the melancholy sight of police officers guarding a synagogue she had just passed. It is indeed a sad sign of the times and quite right that the police are there. She obviously is blissfully unaware, if she wasn’t she would have mentioned it, of the actual attacks upon mosques and other Muslim property which happens so regularly in Britain that it scarcely makes the news (at least that might be the reason it scarcely makes the news). In my own constituency just last year a fascist organisation actually invaded several mosques and terrorised the worshippers therein as well as invading the home of the then Lord Mayor of Bradford just because he was a Muslim. An elderly Muslim man in Birmingham was decapitated by a Muslim-hating fanatic prior to the atrocious murder of Lee Rigby. The two events attracted very different levels of media coverage, and sadly there were no police officers standing guard to prevent them. But Odone is obviously equally unaware of the plight of the Christians of Palestine. The pleas of the hierarchy in Jerusalem have not been heard by Saint Cristina. Even the Holy Father praying at the Apartheid Wall with the Catholic faithful passed her by. She doesn’t know that Bethlehem is under siege, surrounded by checkpoints and walls and that expectant mothers often give birth, and die at them. She doesn’t know that Nazareth seethes with anger at the cruel fate of the Palestinian people trapped there, as “Israeli Arabs”, the lowest class of “citizens” in the apartheid system. Last and certainly least is the hapless Tristram Hunt MP (who attended the same expensive public school as Freedland, in fact I was the only person sitting at the table who hadn’t been educated at a private school). Struggling all night as a B (lair) division stand in for New Labour he said only two things of any note. The first was when he managed to slander the entire worldwide movement for Boycott Divestment and Sanctions against Israel as a movement for boycotting “Jewish goods and shops”. This slander was probably the result of stupidity rather than wickedness though I’m not sure which is worse in a man who wants to be in charge of our schools and universities. And the last was when in his peroration he made the ritual act of obeisance and pledged himself and his party to the eternal and undivided determination to ensure the safety and security of the state of Israel. That wasn’t a result of stupidity. That was the real New Labour deal.